I've said it before and I'll say it again, the Ivy Granger Series is fantastic! Ghost Light was a great second book. Luckily, it didn't have that second book curse that most series have. We have all experienced the second book curse, where the second book in the series isn't as great as the first one and kind of tugs down the series till book three revives it. Ghost Light didn't have this problem. I think it is because of the structure these books take. This series doesn't really have tales that lead into each. I mean, they all obviously belong in the same series, but it's almost as if each book tells it's own little story of Ivy's life. You still have to read them in order, but it isn't full of cliffhangers. With a series like that there could be an infinite number of books in the series and none would take away from the series as a whole, because they offer their own little story to tell. Speaking of own little unique story, Ghost Light's story was fantastic. It was a very absorbing and entrancing story line and I think that was partly because E.J. really picked topics that would pull on the readers heartstrings. I won't tell you what the big plot device was since it doesn't give it away in the books description, but just know that I thought it was genius. It really had me hooked and rooting that time would be on Ivy's side. The only thing that I didn't really like was the ending. It just didn't seem powerful enough. I felt like the ending should have been like BOOM! THE END! But at the same time that really isn't this series style. Still I think it definitely would have added to the series thrill factor if there was a cliffhanger thrown in. I still enjoyed everything, I just thought it was maybe too pleasant of an ending. It does give a good sneak peek as to what's coming in the series future. Regardless I am still a huge fan of the series and I cannot wait to see whats in store! Really great second book! It didn't have the terrible book 2 in a series curse, which I was very thankful for. The plot was ingenious and really pulled on your heartstrings. Good thinking E.J.!! However, I do wish that ending was a little more powerful. Regardless it was a great read and I am still a huge fan of the series. Paranormal fans if you haven't picked up this series yet, what is wrong with you? 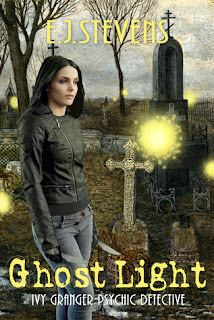 Don't forget to check out the giveaway for Ghost Lights Release HERE! !